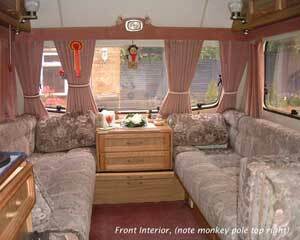 No layout changes were made to the front but the water heater was relocated under the front right hand berth to allow removal of a dinette seat. 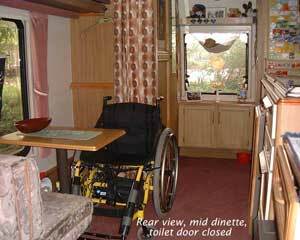 This created the wheelchair space shown above. The toilet/shower compartment access was widened by fitting a double hinged door as shown in the left hand photograph. A small cupboard was built below the back window with a wardrobe built to the right of this. 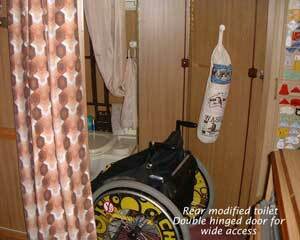 The whole rear end can be screened off using the curtain behind the wheelchair to make a large bathroom/changing compartment.